Click here for a full specification pdf file. 1/2 Page Spread (bleed): 17.25" x 5.625" / 17" x 5.5"
1/2 Page Horizontal: 7.5" x 4.83"
1/2 Page Vertical: 3.68" x 10.125"
1/4 page Vertical: 3.68" x 4.84"
All materials must be submitted according to the specs shown below. *All sponsorship agreements take precedence to advertising requests. Ask for placement availability. Ads must be submitted as high-resolution PDF files with fonts embedded. 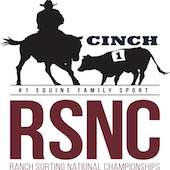 Disclaimer: The Ranch Sorter nor the Ranch Sorting National Championships, will not be responsible for quality of photo or ad reproduction as a result of any digital files supplied. We will not be held liable for any financial compensation or discounted advertising as a result of poor reproduction quality of digital files. All digital files supplied for use in The Ranch Sorter newspaper will be used at the advertiser’s risk.